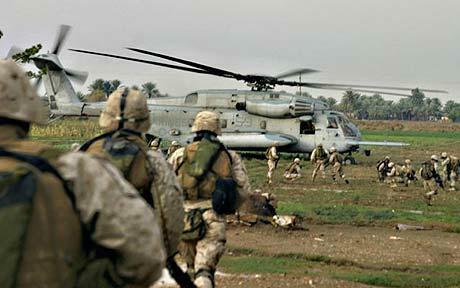 The attack of four American helicopters on the village al-Sikr which lies eight kilometers into Syria along the Iraqi border and resulted in the deaths of nine farmers of this village caused many people to doubt about America’s purpose in this attack. America’s mission in a military point of view was not important because a few helicopters breaking the borders of a country in the middle of the night and striking civilians does not cause any damage other than the destruction of people’s natural rights – and America has a long history of doing just that. In giving excuses for their actions, America claimed that their purpose was to kill one of the leaders of Al-Qaeda. Another American source claimed that one of the well-known leaders of Al-Qaeda by the name of Abu Ghayda was killed in the raid. But, just as the report of the Associated Press in this regard mentioned, nobody heard of his name before this event. With this characterization it must be said that Abu Ghayda – if he really exists – became a member of Al-Qaeda after death becoming one of its leaders.